“Our baby boy grew his wings tonight at 2:30 am,” expressed Kate. “My gladiator lay down his shield and gained his wings at 02:30,” Tom Evans, his father, lamented through social media. 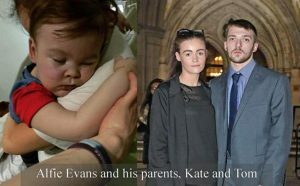 The desperate plight of Alfie Evans, the 23 month old British boy and his parents’ tireless efforts to save his life captured the attention of the world for over four months. World and national leaders including President Donald Trump, Pope Francis, European Parliament President Antonio Tajani, Polish President Andrezej Duda and an army of ordinary citizens all over the world spoke out and pleaded for his life, outraged over the Liverpool-based Alder Hey Children’s Hospital’s handling of the boy’s medical care. Alfie died last Sunday, April 28th at 2:30 a.m. attributed to an undiagnosed neurological disorder. The actual cause of death is unclear with questions remaining about the role of the removal of life support, minimal level of food and hydration, and, possibly, what some observers are writing about inferring the lack of treatment for a lung infection. What is clear is that the hospital, part of England’s socialistic National Health Service, removed Alfie’s life support to aid his breathing and supply of food and hydration without his parents’ permission. Fluids were restored 28 hours later after the ensuing public outcry. The Alder Hey Children’s Hospital in Liverpool which maintained custody of the child removed life support on Monday, April 23rd. He continued to breathe on his own for five days in spite of the removal of life sustaining fluids for over a day which weakened the boy’s condition further. At the same time I was reading the news about Alfie’s death, another international news item popped up about England’s Prince William and Kate Middleton, the Duke and Duchess of Cambridge, who had just announced the name of their newborn baby boy – Louis Arthur Charles. What would be his fate, I thought, if God forbid, His Royal Highness Prince Louis of Cambridge was stricken with a similar undiagnosed disease that had befallen his fellow countryman, 23 month old Alfie Evans? While world leaders and nations were working to save Alfie’s life, his own country’s national health care overloads were doing everything they could to end his life. The Alfie Evans case is a complex story which takes effort to understand. It touches our hearts because it involves a little innocent child. But it’s not unique. We’ve seen disturbing situations before as in the case of fellow Britisher, 11 month old Charlie Gard, who died last summer after his parents lost their battle to keep him on a ventilator. There have been long, drawn out public debates in the U.S. pointing to the accelerating breakdown of moral and ethical standards in patient care in our country’s health care and legal systems such as the cases of Terri Schiavo and Jahi McMath. There are many disturbing issues related to Alfie’s case. Why was the attending hospital, Alder Hey Children’s Hospital in Liverpool, insistent in letting the boy die in spite of domestic and international support with institutions offering to take the burden of care away from the hospital to try to save his life? Alfie was granted Italian citizenship to allow him to be transferred to the Bambino Jesu Pediatric Hospital in Rome for treatment. An air ambulance was sent to transfer the child to Italy but the British Judge overseeing the legal case, Anthony Hayden, prohibited the transfer. The Medical Ethics Alliance, A British doctors organization, issued a statement demanding Alfie’s release from Alder Hey Children’s Hospital and indicated that it supported the family’s efforts to take him to a hospital in Rome where the boy would be provided medical care and the potential benefit of new experimental treatments. The statement from the Alliance added that “The parents were stripped of their right to be decision makers for their beloved child. The High Court decided that it was in the ‘best interests’ of Alfie to die and duly authorized the withdrawal of treatment. Dr. Izabela Palgan, a pediatrician and children’s oncologist who diagnosed the 23-month-old on his parent’s request reported, “But the child is not a dying child. On the Pediatric Glasgow Coma Scale the child ranks at about eight to nine points, so this is not a case of brain death“. Other troubling questions about the intentions of Alder Hay Hospital authorities have surfaced. The hospital was embroiled in a huge public scandal in the early 2000’s over the stockpiling of babies’ organs after admitting that it gave a pharmaceutical company body parts from living children in return for financial donations. These actions were done without the consent of parents and family. While another case exposing the despotic abuses of the British nationalized health care system may have ended as badly as the Evans and Gard stories, the Ashya King case gives us hope. In 2014, stricken with cancer, five year old Ashya King was scheduled to undergo chemotherapy and radiation treatment at Southampton General Hospital. His parents were alarmed that the treatment would leave him brain damaged. Against medical advice, they fled the country. They were arrested in Spain on charges of child cruelty. The Kings subsequently won the right in court to take Ashya to the Czech Republic for revolutionary proton beam treatment, unavailable under the UK’s National Health Service. The parents recently announced that their son has been cancer-free for more than three years, attends school and, aside from a slight weakness on his right side, shows no sign of his former illness. In the case closer to home in the state of Massachusetts, in 2005 comatose 11-year-old Haleigh Poutre was declared “virtually brain dead,” in a “persistent vegetative state” after suffering brutal beatings and sexual abuse by her stepfather. Doctors at Baystate Medical Center got a court order to remove her ventilator support and feeding tube. But in 2006 before her life support was removed, she awoke from the coma. Now 24, Haleigh lives with her adoptive parents who lavish loving attention on her. She is disabled and confined to a wheelchair but attends a special education program, feeds herself, and communicates with a letter board. I suspect there is a lot more going on in England with the Right to Die movement coalescing nationwide with the socialist government-controlled health care systems AND hospital, hospice, and medical associations aligned with them. We have been fighting this trend in Texas, believe it or not. Fully conscious or not, state and national associations of physicians, nurses, hospice, medical centers are aligning with the Euthanasia movement for various reasons not the least of it is money and operational “efficiency”. After all there are only so many hospital beds to go around is the thinking in boardroom meetings and cocktail parties and country clubs. Like the abortion industry, they have become adept at manipulating benefactors and public opinion. What we’ve witnessed in the Alfie Evans, Charlie Gard, Terri Schiavo and other cases are acts of passive euthanasia. Patients with serious disabilities and injuries are simply left to die without proper life sustaining care. Beware of “death with dignity”, “compassion and choices”, “quality of life” sophistries from the Right to Die movement. According to the foremost anti-Euthanasia organization in the U.S., the Patients Rights Council, the state of Texas is the most draconian regarding “futile care”. It permits a hospital ethics committee to decide if a patient’s care is futile which most often will result in instructing staff to remove life sustaining care and require the patient to leave. The food placed in a feeding tube is inexpensive. A full day’s supply averages under $10. It is a quick meal, conveniently administered although all too often medical ethics panels and medical professionals consider this type of feeding “extraordinary medical treatment”. Tube feeding has been around for over 100 years! In Texas there has been a ferocious battle in recent legislative sessions (2013, 2015) where hospital, medical professional organizations and their allies have repeatedly attempted to change the Texas Health and Safety Code. Currently the statutes have shifted decision making authority over end of life conflicts from patients and their surrogates to medical institutions and practitioners and hospital ethics committees. Ambiguous language in bills proposed by the medical establishment is common, triggering severe warning bells to watchdog organizations defending patients rights and individual protections enshrined in the Constitution. Texas legislators allied with the medical establishment have attempted to pass legislation to weaken definitions of terms in the Health Code pertaining to delivery of food and hydration to patients; authority in removing life support, i.e. physicians’ issuing a “Do Not Attempt to Resuscitate” order without sufficient consultation and approval of the patient, their family, and surrogates; redefining essential and ordinary care to sustain life by differentiating how food and hydration are provided (orally vs. through a feeding tube) and the use of a ventilator to aid breathing for patients who are not dying; and by classifying ordinary or “natural” life sustaining care as extraordinary when “artificial means” are used to benefit patient recovery. 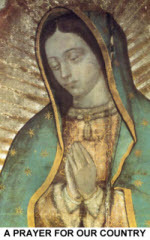 To aid you and your family in making end of life and critical care decisions, go to the Patients Rights Council website for more information and advice about advanced directives, legal and ethical standards regarding life sustaining food and fluids, and most importantly, request a copy of the Texas Protective Medical Decisions Document (PMDD) for yourself and your loved ones. The PMDD (called a Medical Power of Attorney in Texas) is a durable power of attorney for health care. While we grieve with the Evans family, let’s look closer to home in the state of Texas to be ever vigilant to ensure we maintain our freedoms, our autonomy, and our constitutional rights in protecting the lives of the most innocent and helpless members of our human family – the unborn, the disabled, and incapacitated, those who cannot defend themselves, especially those nearing the end of their earthly lives. Excellent article. Life should be defended from Conception to Natural Death, and Natural Death should not consider depriving a person of nutrition and hydration whether it be my mouth or by assistance such as g tubes or intravenous methods. Harvesting organs should not be the determinant for an individuals life decisions.